Humans are creatures of sight, then we think in terms of feel and then sound. The human sense of smell does not get the credit it deserves, according to a new paper. 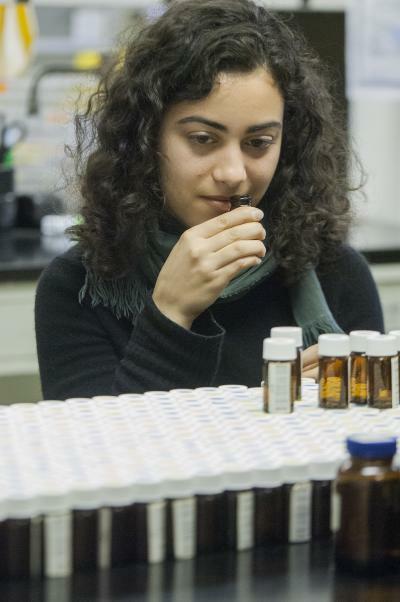 In an experiment led by Andreas Keller, of Rockefeller's Laboratory of Neurogenetics and Behavior, the ability of volunteers to distinguish between complex mixtures of scents was tested. Based on the sensitivity of these people's noses and brains, the team calculated the human sense of smell can detect more than 1 trillion odor mixtures - the existing generally accepted number is just 10,000. In fact, even 1 trillion may be understating it. "The message here is that we have more sensitivity in our sense of smell than for which we give ourselves credit. We just don't pay attention to it and don't use it in everyday life." The quality of an odor has multiple dimensions, because the odors we encounter in real life are composed of complex mixes of molecules. For instance, the characteristic scent of rose has 275 components, but only a small percentage of those dominate the perceived smell. That makes odor much more difficult to study than vision and hearing, which require us to detect variations in a single dimension. For comparison, researchers estimate the number of colors we can distinguish at between 2.3 and 7.5 million and audible tones at about 340,000. To overcome this complexity, Keller combined odors and asked volunteers whether they could distinguish between mixtures with some components in common. 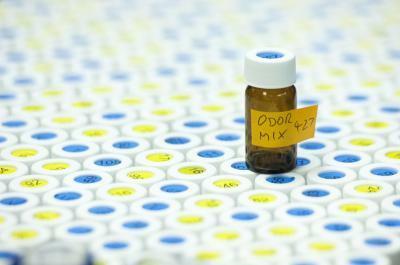 "Our trick is we use mixtures of odor molecules, and we use the percentage of overlap between two mixtures to measure the sensitivity of a person's sense of smell," Keller says. To create his mixtures, Keller drew upon 128 odor molecules responsible for scents such as orange, anise and spearmint. He mixed these in combinations of 10, 20 and 30 with different proportions of components in common. The volunteers received three vials, two of which contained identical mixes, and they were asked to pick out the odd one. This approach was inspired by previous work at the Weizmann Institute in Israel, in which researchers combined odors at similar intensities to create neutral smelling "olfactory white." In that experiment and in Keller's study, the researchers were interested in the perception of odor qualities, such as fishy, floral or musky – not their intensity. But since intensity can interfere with the perceived qualities, both had to account for it. The results, published this week in Science, show that while individual volunteers' performance varied greatly, on average they could tell the difference between mixtures containing as much as 51 percent of the same components. Once the mixes shared more than half of their components, fewer volunteers could tell the difference between them. This was true for mixes of 10, 20 and 30 odors. By analyzing the data, the researchers could calculate the total number of distinguishable mixtures. "It turns out that the resolution of the olfactory system is not extraordinary – you need to change a fair fraction of the components before the change can be reliably detected by more than 50 percent of the subjects," says collaborator Marcelo O. Magnasco, head of the Laboratory of Mathematical Physics at Rockefeller. "However, because the number of combinations is quite literally astronomical, even after accounting for this limitation the total number of distinguishable odor combinations is quite large." The 1 trillion estimate is almost certainly too low, the researchers say, because there are many, many more odor molecules in the real world that can be mixed in many more ways. Keller theorizes that our ancestors had much more use and appreciation for our sense of smell than we do. Humans' upright posture lifted our noses far from the ground where most smells originate, and more recently, conveniences such as refrigerators and daily showers, have effectively limited odors in the modern world. "This could explain our attitude that smell is unimportant, compared to hearing and vision," he says. Nevertheless, the sense of smell remains closely linked to human behavior, and studying it can tell us a lot about how our brains process complex information. The results of this study are a step toward an elusive quantitative science of odor perception that can help drive further research, Keller says.